Birthdays are special. Special, and ordinary at the same time. Everyone has a birthday, everyone gets cake. Or an ice cream cake if you are my husband. Certain birthdays are considered more special than others, like the first one. I never understood that more than with my Izzie. During Isabelle’s first year there were many losses in the heart community. Babies who barely made their sixth month birthday or knew their parents arms. It was heart wrenching to read posts of these devastated parents trying to figure out what happened. I will never forget bringing Izzie to the ER after she didn’t take enough milk in over a few days and being told that if she got dehydrated, it would have been disastrous. I believe the phrase said to us was “a dehydrated hypoplast, is a dead hypoplast.” I never felt silly about bringing her in after that. For some reason, I didn’t freak out like I thought I would during her open heart surgeries. Maybe it was because her surgeon made me feel secure. Or, I could have been in shock that once again she was going through a brutal repair. The moment when I wondered if we were ever leaving the hospital happened when her incision became infected. That upset me more than anything. What if we never get out of here? What if this sets things in motion to go the other way? 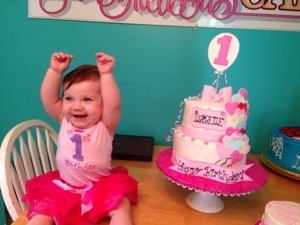 At that moment, celebrating a first birthday seemed distant, someone else’s dream. As she recovered and we went home for the last time (until the next one), I could breathe a little easier. She began to act like a baby instead of a perpetual newborn. A first birthday would be more of a reality. And here is where Icing smiles comes in. Here is an organization that donates cakes to medically fragile children and their siblings. And not just any cake, your child could get a dream cake, like you would see in Cake Boss! Dream cakes are only handed out once for each child but they could still receive a cake for their birthday if they qualify. I applied and we were accepted for a cake for Isabelle’s first birthday. Amazing. An ordinary object like a birthday cake made extraordinary. We also got a baker out of the deal- Melissa, from Sweet Melissa’s Cookies and Cakes was so happy to have been part of our special milestone, and her cake was exquisite! I order her a cake for every birthday we have had because she does such an incredible job. It also gives me an excuse to thank her over and over again for giving us such an incredible cake to match our incredible moment of our daughter’s milestone. I am so grateful to Icing Smiles for providing us with such a blessing I volunteered to spread the word. If there is a critically ill child that you know of who could use a pick me up, let me know!